For the sake of accuracy, it is good to distinguish between non-infectious wilting and blight. Both look similar and can be easily confused, but they are actually different. Blights can lead to wilting strawberry plants, but wilting is a symptom only. Wilting is evidence of a problem, not necessarily a disease (blight). Why Do Strawberry Plants Wilt? Strawberry plants are forbs. This means that they lack the above-ground woody tissue that many plants have (like trees), but they are still vascular. Without the woody tissue, their stems cannot thicken and stiffen to support increasing vertical growth. Consequently, they are short and rely on turgor pressure to maintain an erect habit. At the cellular level, strawberry plants have cell walls. Turgor pressure is the pressure derived from the inner plasma membrane pushing against the outer cell wall due to osmotic forces. Water from outside the cell moves from an area of low solute concentration into the cell’s vacuole, which has a higher solute concentration. This increase of water inside the cell causes the turgor pressure and the plants rely on this turgidity to maintain their rigidity (which gives them their normal shape and appearance). If they lose their turgidity, they lose their rigidity, and they wilt. If your strawberries experience drought-like conditions, they will wilt. A continual supply of water must be transmitted from the roots upward and into the cells to allow osmosis to maintain turgor pressure and rigidity within the plant tissues. If no (or not enough) water is available, the droop will set in shortly thereafter. Cold temperatures prevent the free flow of water through a strawberry plants vascular system. As with drought above, this results in insufficient water passage through the plant, the loss of turgidity, and the loss of rigidity. The plants will droop when the weather gets too cold to maintain proper cellular function. Fortunately, strawberry plants recognize this temperature shift and will go dormant instead of dying as most annual plants will. Then, when temperatures rise again toward the end of winter, the plant wakes again and sends forth new foliage that functions appropriately at the cellular level. Turgor pressure is the result of osmotic forces. Water will move across a semi-permeable membrane to the area of highest solute concentration. If the salinity of the surrounding environment is higher than that within the cell, the same osmotic draw that normally pulls water into the cell to maintain turgidity will work in reverse. As water is drawn from the cells and into the environment of higher solute concentration outside the cell, it will wilt. The process of moving water throughout a plant requires some energy. This energy is generated by the process of cellular respiration. If the soil is waterlogged, oxygen levels can drop to levels that do not allow the roots to respire. If this occurs, they will not be able to transport sufficient amounts of water up into the plant, even though there is an abundance of water. This over-abundance of water will not only prevent water flow into the plant and thereby cause wilting, but it also sets up the plant for the next cause of wilting. In other words, if drowning doesn’t kill it, a disease probably will. Blighted strawberry plants will likely eventually wilt. When pathogenic fungi or bacteria manage to infect the tissues of a strawberry plant, wilting is often not far behind. The pathogenic organisms work their way into the structures of the plant and can clog the vascular system. Clogged vascular systems leads to poor water flow which leads to wilting which leads to death. Also, parasitic infestations can also cause wilting. As mites or other insects feed on the strawberry plants, their cellular structure loses its integrity. Water leaks out of the holes, and as the plants lose more and more water from the damaged areas, they wilt and eventually die. Unlike trees and other woody plants that have celluloid supporting structures to keep them erect even when problems are affecting them, strawberry plants readily demonstrate their infirmity when they are afflicted. Wilting is a sign that something is wrong. 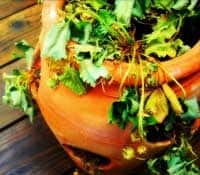 If you notice your plants looking sickly and wilting, take quick action to identify the underlying problem and rectify it as soon as possible. Wilting decreases the ability of your plants to transpire and grow, so if you don’t remedy the cause of wilting quickly, your plants will die. Wilting at its heart is all about water, as you may have noticed. Too much or too little or too salty and plants begin to struggle for life. Even when strawberry plants are infected with a bacterium or fungus, the pathogens typically kill indirectly as the water status of the plants at the cellular level is compromised. 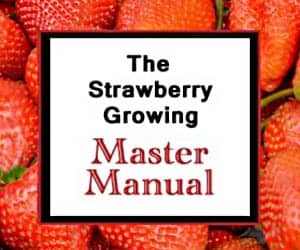 Be sure to review the Growing Strawberries reference page to get your strawberry plants off and growing well. And, be sure to see the Strawberry Plant reference page to learn more about the wonderful strawberry plant! Hi, we recently built a wooden planter and painted it green. Sealed with a membrane then some compost and planted fruit plants. Have recently had a bad storm but all the leaves on the diff fruits are staring to go black? Could it b the weather or something else? I’ve had strawberry plants alive in my house for 3 years, just gave them some miracle grow a week ago and they are shriveling up, I was using a different, weaker, generic plant food and they did great for 3 years. Now all of a sudden there dying. I think its the miracle grow. I have tried to grow the strawberry in hydroponic method in air-con office. The air-con temperature is about 21 to 22 degree. The leaves are turning yellow and start to droop. How can I save the plants ? Thank you. You might have a pathogen or other disease-causing organism in the water, or the nutrient flow might not be adequate. Sometimes a nitrogen deficiency will cause yellowing. Good luck! Hello. My younger brother recently bought a strawberry plant and started to regularly water it. But two days ago he overwatered the plant and now the leaves are almost all drooped. The soil is very wet but we don’t know of any reliable method to dry it without taking out the plant and repotting the strawberry again. Besides my brother covered the plant with some kind of plastic and i suspect this is further complicating the supplement of oxygen to the plant. What should i do? Make sure the drain holes in the bottom of the pot are not clogged, remove the plastic, and hope for the best! Good luck! I have five everbearing strawberry plants in a hanging basket outside. They’re in their second crop right now and when I checked them this morning, the whole basket was fallen over and limp but still green. I had been used to steady raining and I think I underwatered them. I watered them as soon as I saw their state. Do you think they will be okay? Yes, if they just needed watering, they should be ok if you watered them soon after they started wilting. Good luck! It was windy this past Sunday and my beautiful, huge potted strawberry plant is now bent to one side. It was a bare root plant when I got and planted it and has been outside for about 1 month. I have thought about righting the plant and tying it to a wooden stick but I am not sure. I would recommend making sure no dirt is covering the leaves and that it is placed in a sunny spot. If you do that, it should perk up and be minimally affected by the wind blowing it during the storm. No need to stake it to a stick. Good luck! Please help me! I bought a strawberry plant from Lowe’s a month ago, and there were quite a few plants in that one pot. They were growing very well, but I saw on the internet that people separate the crowns. So, being the beginner strawberry grower that I am, I separated all the plants and replanted them in a very large pot. ALL THE LEAVES THEN PROCEEDED TO DIE ONE BY ONE. There are new leaves growing, but they are drooping once they reach 2 inches in stem length. What do I do? I have mulch on top of the soil, and I made sure to keep the plant raised. I also water them every day. They might be getting too much water. Strawberry plants need water, of course, but soggy soil or standing water can cause pathogens to infect them or cause rotting to set in. If new leaves are growing, my guess is that the watering you are doing is excessive. Maybe cut back a bit and see if they perk back up. Good luck! i bought a strawberry plant,after 3 weeks the strawberries were becoming red,then 2 weeks later it started welting i picked the strawberries a bit late, so through it away[was not right] then the plant welted all its leafs.i dug it up and berried it. I’m sorry to hear about the loss of your plant. Nice word play at the end there, though. Good luck! I was given a hanging pot with a huge plant that was overgrowing out of the pot. I put it into the window on the opposite side of my tomato plant and now they are both not doing well. All the extra bines overgrowing the pot have died and the poor thing just looks worse and worse. My tomato plant seems to be perking back up some after I seemed to have found a small blight issue but none of that started until after I brought in the strawberry plant that was overgrowing when i was given it. I’ve tried separate rooms and windows and taking them out of the window. They are in a shade most of the day b.c my apartment faces the north. I’m not sure what’s going wrong at this point. I know they get sun. I check the soil. I got them fertilizer. I’m at a loss at this point on what to do to even start to save them. I’m not sure what is happening with the tomato plant unless one or both was contaminated with Verticillium. The strawberry plant, however, shouldn’t be allowed to continue to put runners out and hang down the sides of the pot for a couple of reasons. First, since those other runner plants can’t be rooted in the air, they will place a drain on the mother plant to sustain them. Second, as they grow, they will pull on the mother plant and stress it in the process. I’d snip off the hanging parts of the strawberry plant and see if that helps it perk up any. Good luck! Hi I just cut my strawberry runners then the runners started wilting but it has rooted everything is healthy before cutting the stems are straight up then after that the stems starts falling over any explanation? Is it a shock cause I just cut my runners from the mother plant . When the daughter plant immediately wilts after cutting the runner, it almost always means that the root system hasn’t established itself well enough to support the plant yet. To make absolutely certain that the daughter plant is established well enough to support itself, just wait until the runner becomes brown and brittle/shriveled. At that point, the daughter plant should survive on its own, and the runner can be snipped the rest of the way. Good luck! Hi, I have 2 small strawberry planters that sit side by side on my patio. I planted them from bare roots this year and they’ve been doing very well until yesterday. The plant in the top of one of my planters is wilted and droopy. When I looked at the base of the plant I saw some bugs crawling around in there. Is there anything I can do to save the plant and/or the lower plants which still look ok? Please help! Conventional pesticides will work effectively, but they may also be taken up by the plants. I’d try a liberal application of diatomaceous earth first as it is safe for plants and people, but not so much for insects. Good luck! It is possible, but they likely had their roots damaged in the move. To try to save them, if that is in fact what happened, trim off any older leaves leaving just 2-3 of the newest. They may still perish, but that might save them. Good luck! I just received a hanging strawberry plant that I ordered a few months ago. There seem to be multiple plants in the pot. One side of the pot is very green and fluffy and the other side is limp, yellowed, and has some dried up brown leaves. Is the limp side dead? Should I take the plants out and re-pot the living one on its own? Try watering it first. If the wilted plant doesn’t perk up, it may be dead or dying. If the cause of death is a pathogen in the soil or a pest, re-potting is the best option to save the others. If you aren’t sure what caused the first to have problems, it is best to leave the others planted and hope for the best as transplanting causes stress to the existing plants. Good luck! It may be due to over/under watering, or they may have contracted a disease. Try the Library for help! Good luck! I just planted 5 plants yesterday. Four of them look great but one (the one with the most little blooms and a few tiny berries is drooping badly. It’s not water logged. Can it be saved? If you just planted them yesterday, I’d consider shading them for a few days if they had been indoors prior to being planted. If not, I’d actually probably try watering them more to help the soil settle around the roots. Good luck! Came here for strawberry advice. Instead had best laugh of the day. Princess Bride comeback a thing of beauty. I’m glad I could provide a bit of levity for you! The Princess Bride is a classic! I have 3 raised bed of strawberries which I grew last spring. They did really well in spring. About two months ago one by one the plant look sick , wilt and die. I am so sad. Today I pull up one look sick plant I saw its roots are surrounded with something white. It looks like some kind of fungus. Then I notice that the top of the roots are dried up. Waht should I do? I mix the soil my self before planting them with vemiculus, moss and compose from my garden. Another problem is the strawberries turn brown and look dry, some even crack even though they taste good. Did I fertilize it too much? It sounds like you have pathogenic fungi. I’d recommend trying to identify it with the resources in the library. Good luck! Hi there, thanks for the wonderfully informative website! – i have a question regarding a wilting baby strawberry plant which i took from a runner, it had been doing well in water for a few days and started to grow some tiny roots (a couple of mil long) so i tried potting it up in vermiculite and compost but it immediately wilted and looked very poorly. I panicked and put it back into water (thinking maybe its roots aren’t big enough yet) and it perked righht up… -i realise now it should have been rooted while stil connected to the mother but i wasn’t able to do that. My question is how long will it last in just water, and is there anything i can do to help it develop its roots better so i can plant it up properly? The plants will often struggle when separated from the mother plant prior to establishing themselves. You may want to try adding some minerals to the water and providing support with a nutrient wash similar to what hydroponic growers use. More than likely, however, the best option would be to wait for another runner plant to be sent out from the mother plant, affix the node to the soil, wait for it to root there, then snip the connecting runner after that. Good luck! little progress. “Please help” ………. You might want to try moving them outside to see if that perks them up a bit. They will do best in full sun, but you can’t put them in full sun right away without damaging/killing them. Try moving them outside to shaded area first. Then, expose them to about an hour of sun for the first day and increase that amount by about 30 minutes per day. Start with early morning sun first (don’t put them out at noon for the first time). They may also have succumbed to a fungus of some sort. If the soil remained too moist, that is probably the most likely culprit. Good luck! Thank you very much Mr Strawberry for this site. I am a new strawberry farmer based in Africa, Kenya. Though very different both climatically and on the strawberry variety grown, I have found very helpful tips. I grow a variety called Chandler in an open farm. Am in the third month and hope to start picking by the end of this month – June 2015. Any extra tips based on the region and the variety mentioned? Thank you once more. I’d just review this! Good luck! Hi. I just found this site and I love it. I am new to planting strawberries and everything has been going great so far. This week I noticed some of the leaves on top seem very witty and are shriveling up. I am in the Northeast and we had some low nighttime temps in the 40s this week- but highs during the days have gone to almost 90. Not sure if that is it. I am watering them everyday and the soil is moist. They are in 3 whiskey barrel planters- huge. I have not put them in ground bec I don’t have room and don’t want them to grow into the cucs, peppers and tomatoes. I am going to put the runners into other pots since they seem to be growing well, too. Any thoughts or suggestions regarding the wilting? Thanks! I would just keep an eye on them at this point. It is not uncommon for a few leaves to whither and die without any adverse effect on the overall plant. Good luck! Should I clip back some leaves on the strawberry plants I just put in a jar? They look a little wilted, probably caused by shock of transplanting. No, transplanting can be stressful. I’d recommend leaving them. As the plant gets used to its new location, it should perk back up. Good luck! I was afraid it had just been too wet. Regarding the plants I have growing in gutters suspended on the fence – I’m hoping they are going to dry out over the next couple of days. Do you have any recommendation as to what I might do to remedy/avoid this problem? I don’t know if it’s safe to “lift” the plants with their surrounding dirt and try to put some more gravel underneath to increase drainage. Or straw? Please – any ideas are welcome. I’d like to keep the plants happy and healthy. They were doing so well – and some still are. I’m not sure, but you might want to cant the gutters a bit so that there is more natural water drainage. Don’t do too much, though, or the water will take your soil with it! Good luck! I have a lot of strawberries planted in gutter gardens on my fence. They have been doing well and are making a good number of berries. These are some second-year plants that were transplanted months ago from a raised bed, along with many of the plants that the original ones produced from runners. Here’s the problem – first, one plant wilted and died. Then, another wilted some weeks later, and then, just a few days ago (about 2 weeks after the last one, 2 more have wilted. I don’t think they are going to make it (and they even had small berries on them!). I should have thought the gutters would drain pretty well (they have lots of drain holes and a small amount of gravel in the bottom), but we have had horribly heavy rains for days now. The soil is wet. Can this be the problem? Any ideas how I can fix it? Or am I just doomed to lose a bunch of the plants before it dries out? The ones that remain in the raised beds are doing fine…many thanks for your help. Yes, too much water or waterlogged soil can definitely cause plants to wilt and die. Strawberry plants need a well-drained soil to avoid succumbing to crown rot or other pathogenic fungi that thrive in too-moist conditions. Good luck! Mr. Strawberry, you are my hero. Thank you for this website, it is very helpful for strawberry gardeners everywhere. Absolutely NO HELP what so ever. Struggling gardener s click on this page hoping to find actual helpful answers, and all we get is complete generic rhetoric stating the obvious. AND I QUOTE FROM YOU: “The root of wilting strawberries is water, not too much, not too little” REALY EINSTEIN!! Oh, and maybe a disease or two. That’s like taking a human who is having trouble breathing to the ER , and the doctor tells you it’s because this person is not getting enough air in their lungs. EXPLAIN how to water properly, how much per plant, per day, per week, how to we tell if it to much water as opposed to not enough?…Etc etc etc. You’ve fallen victim to one of the classic blunders! The most famous is: never get involved in a land war in Asia. But, only slightly less well known is this: never go in against a Sicilian when death is on the line! Fortunately, I’ve written extensively about such topics. Hopefully, you’ll be willing to read a bit more, rant a bit less, and spare my poor life. Good luck!